REVIEW: When you die, what happens? Lots of folks are attempting to make money by demonstrating they have the answer, but there’s this teeny-tiny thing called facts getting in their way. Mary Roach finds humor in every bone-chilling moment of her investigation. People have a tendency to fall into one of two categories regarding death. There are those who believe that when we have shuffled off this mortal coil there is something that carries on: energy, the soul, auras, eukaryotic or prokaryotic cells, sense-memories, etc. And then there are those who say that when you’re dead you’re dead. For what it’s worth, I fall into the former category. Except, y’know, for those damn eukaryotic cells which I say just cannot be trusted. In the search for evidence supporting either position, author Mary Roach performed a great deal of research, and I’m glad she did because some of it is kinda-sorta icky. So right away we all owe her a hearty Thanks a Bunch! She also conducted a large number of interviews, many of which were sprinkled with non sequiturs, half-truths, and/or distortions, but many held out the promise of finding some reasonable answers. Quite often, these promises rely on just a few more studies which will require a new grant or bequest or donation or funding to enable the continuation of this important work, etc. etc. please send money now, and so on. Fortunately, almost all of her investigations are entertaining for us, even if they were a bit of a trial for her. The result is “Spook: Science Tackles the Afterlife,” one of the most pleasurable books I’ve encountered in quite some time. Keeping an open mind while seeing the lovely absurdity of much of the “proof” she is presented allows Roach to compose one-liners that will make you grin, chortle, guffaw, LOL, or die laughing. Well, I cannot prove that last one, but you get my point. Flawed as it is, science remains the most solid god I’ve got. And so I decided to turn to it, to see what it had to say on the topic of life after death. Because I know what religion says, and it perplexes me…. Religion says that your soul goes to heaven or possibly to a seven-tiered garden, or that your soul is reincarnated into a new body, or that you lie around in your coffin clothes until the Second Coming. And, of course, only one of those can be true. Which means that for millions of people, religion will turn out to have been a bum steer as regards the hereafter. Science seemed the better bet. And so we’re off on journeys to far away lands to examine soul-seekers, ectoplasm enthusiasts, mediums, ghost busters, psychoacoustics experts, electromagnetic field fans, and telecommuters. Oops, I mean those who say they telecommunicate with the dearly departed. England has always lagged a bit behind in discarding outdated terms for the disadvantaged. (When I was there in 1980, it was still possible to shop for used clothing at the local Spastic Shop.) That is, compared to the United States where it takes, oh, about twenty-five minutes for a diagnostic euphemism to become a conversational faux pas. At one point while seeking input, she asks that a reply be kept reasonably simple. “Pretend you are talking to a seventh-grader” is how she put it, to no avail. “His reply ran to a thousand words and would have been understandable to any seventh-grader familiar with Kant, Locke, negentropy as the measure of nonrandomness, and the Enigma encryption machine.” Fortunately for us, Roach is able to translate for us. Roach’s description of communicating with spirits of the dead is quite entertaining. Yes, we’re talking about a séance, where people gather in a room, sit at a table and hold hands. The lights are turned down because “mediums claimed light compromised their abilities and damaged the ectoplasm” and after some singing or incantations, the table would move. Often the medium was using her foot to manipulate the furniture. However, Spirit Table Lifting aids were available for $12 by mail-order through the likes of the Ralph E. Sylvestre Company (“our effects are being used by nearly all prominent mediums,” brags the 1901 catalogue). Other helpful items included Telescopic Reaching Rods, self-playing trumpets, and Luminous Materialistic Ghosts (“appears gradually, floats about the room and disappears”). Proof is a tremendously comforting thing. When I was little, I used to worry that one day, without warning, the invisible forces that held me to the earth were going to conk out, and that I would drift up into space like a party balloon, rising and rising until I froze or exploded or suffocated or all three at once. Then I learned about gravity, the dependable pull of the very large upon the very small. I learned that it had been scientifically proven to exist, and I no longer worried about floating away. I worried instead about blackheads and whether Pat Stone dreamed of me and other dilemmas for which science could provide no succor. Her peeking into the science of the soul frequently comes up eerie and always comes up funny. And traveling along with her is as eye-opening as that moment of magical realism in which the wee Mary wafted away from the earth. In every respect, “Spook” is delightful. Beautifully written, entertaining, and good fun, the most damning thing I can say about it is that it lacks an index, for which I blame the editor and/or publisher. Even Judith Abbate’s design of the book is outstanding (love the spectral photo-images that introduce each chapter). My recommendation is that you borrow or buy a copy of this book, or conjure one up. Your inner smiley genes (I have proof they exist and will share the evidence with you for a small donation) will thank you. 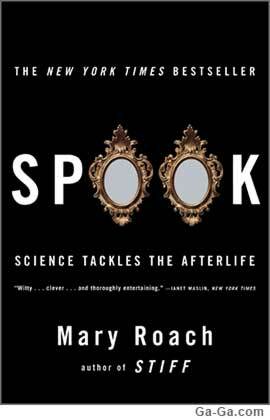 “Spook: Science Tackles the Afterlife” by Mary Roach; W.W. Norton & Company; ISBN 978-0-393-32912-4; 320 pages; $14.95. This original book review is Copr. © by John Scott G and originally published on Ga-Ga, now merged with MuseWire.com – all commercial and reprint rights reserved. Neither this site, its publisher or the review author have been paid any fee or other consideration to compose and publish this original review. The post Dead Uncertain: Book Review of ‘Spook: Science Tackles the Afterlife’ by Mary Roach appeared first on MuseWire.